Bone Meal (BM), as an organic fertilizer, is made up of crushed and roughly ground animal bones and is great source of phosphorus. The color is almost white and a fine powder. It works more slowly than other fertilizers. 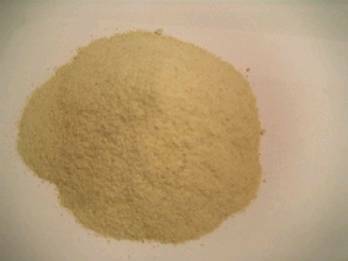 This rich source of phosphorus organic fertilizer consists mainly of calcium phosphate and nitrogen, the amounts depending on the type and age of the bone used. Where raw BM contains 2 to 4 percent nitrogen, steamed BM has 1 to 2 percent nitrogen and up to 30 percent phosphorus and can be purchased at hardware stores and nurseries. BM provides overall plant quality, stem strength, root growth, and helps normal plant maturity. BM can be used as a repellant for certain insects, but it is primarily used as an organic fertilizer. Used as a long-lasting source of phosphorus. Used as bulb food and transplanting fertilizer, because of its high phosphorus content. Use BM in top layer of your garden soil where new roots can find it. Caution: Some BM has been linked to sources of international smuggling to third world countries that contained "Mad Cow" disease. Know the source!